Up and walked Mix – it is very blowy and much colder than it was yesterday. I breakfasted with Mum in the farmhouse. (Olive and Digger are still down in Barnoldswick on Rachel’s narrow boat.) Tom is otherwise engaged today and David is not around this morning so I had a really quiet morning gathering together all the information I could find about Macgregor 19s. It is going to be quite a project to get her all shipshape again and I am looking forward to it enormously. I went across to the farmhouse to wait for the fish man (who normally delivers to us on a Tuesday lunchtime) but although I waited an hour somehow our paths didn’t cross. While waiting I watched Mum’s tv which because it was on Channel 5 I just left on Channel 5. I have never seen a programme like it, it was all about neighbours who had fallen out. Now I can imagine that neighbours do fall out, but why would you want to go on television and tell everyone else about it. No one at all came out of the programme with any dignity. Back in the summer house, I enjoyed some lunch (left over from our feast last night) and then I started looking for a book with which to brush up my navigational skills – I have several but unfortunately I haven’t a clue in which of the hundreds of boxes we have they are to be found. I discovered that there are some stupendous computer courses on offer – I have done the theory before but it was never like this! I am seriously considering taking one of these courses to refresh my knowledge. 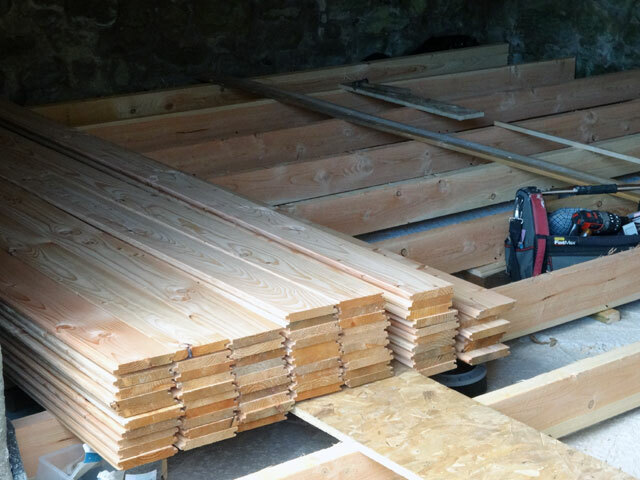 Charlotte arrived with our floorboards – she seemed quite surprised to discover that all of the joists which she had delivered yesterday had already been laid – and Rachel and I started to unload the wood. Just as we got started David arrived and was able to help me to complete the task, and then to get them all neatly stacked in the Bothy all ready for tomorrow when we shall start to lay the floor. David and I enjoyed a coffee and then I got things ready for dinner – Mum joined us in the Granary, after which we watched last night’s New Tricks. (Mum has had a busy day, first at the hairdresser for a perm and then at her Tai Chi, having stayed in Duns for a bite to eat at Hugo’s between the two parts of her programme.) I walked Mix and went to bed extremely early – I have to be ready for tomorrow’s floor-laying!